I am not one of those people who can reflect back on my childhood with memories of chasing butterflies with a net. Instead, I could be found shouting loudly when seeing a spider in the bathtub. Things change… today I study community ecology of Arctic arthropods, and have a deep passion for arthropod of all kinds, from spiders to butterflies and flies. Sarah, with a butterfly net. My interest in entomology began as a challenge, and I love challenges! When I was an undergrad at Université du Québec à Rimouski, Québec, a tackled the big challenge of learning to identify insects. During my undergrad, I participated in several research projects where I could encounter biodiversity of insects and spiders and I developed a curiosity and a fascination about arthropods, particularly those living in extreme Arctic environments. Arthropods are ectotherms, yet they survive, year-round, in a region where the climate is very harsh. I quickly realized that the taxonomy was not the only interesting aspect in entomology. I wanted to identify arthropods in order to do research on community ecology. During the final year of undergrad in Rimouski, I decided to do a research project on the community ecology of spiders in salt marshes. 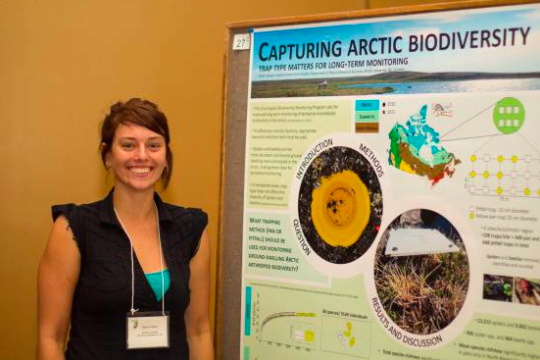 As part of this project, I met Chris Buddle who encouraged my passion for entomology and the Arctic and I was lucky to do a Master’s project on spiders in the Canadian North as part of the Northern Biodiversity Program. I take all opportunities to do outreach, and talk about insects and spiders with anyone who is interested. I am also involved in different societies, including the Entomological Society of Canada, and the Entomological Society of Québec, for which I’m the student representative. I love to volunteer and organize activities for members. Being the mother of two children, I also like to share my passion about arthropods with my kids, their friends and classmates in schools or daycares. I have just started the second year of my Ph.D. I work with the veritable goldmine of data that has been collected from Zackenberg (northeast Greenland), where a long term monitoring program of arctic biodiversity has existed since 1996. My primary research objective is to assess temporal changes of the Arctic fly communities in this region, using the Muscidae and Phoridae families as model study taxa. The second objective of my research project will be to assess phenotypic and genetic changes over the last two decades in two species of Arctic muscids from Zackenberg. For this project, I am co-supervised by Jade Savage, a muscids expert from Bishop’s University, and Toke Høye from Aarhus University. ← What is the motivation for pursuing graduate school?